Slugga Boyz | Azazel's Bitz Box. While it might seem cheaty to finish a single model and call it another squad complete, that’s exactly what I’m going to do here. 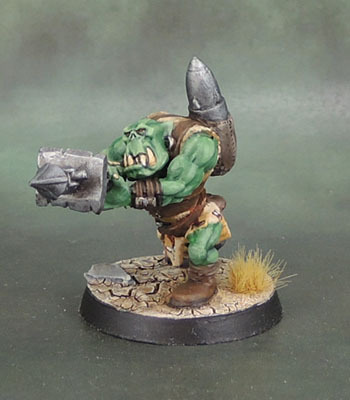 Mostly because finishing this Ork Nob does indeed finish off another Mob of my Orks. 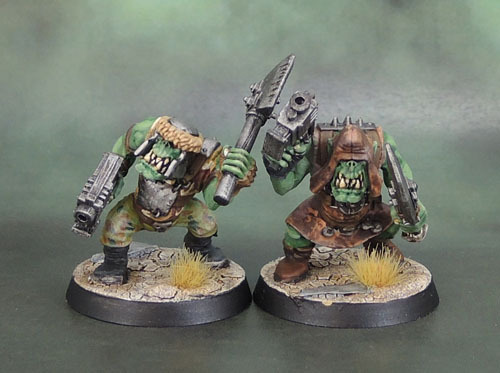 I left him and his mate from a week or so ago to paint last – after I completed all of Da Boyz, because I wanted to do a little bit extra on them – and painting these metal Nobz to lead them would serve as my reward for slogging through the plastic boyz. I may have combined the two of them into a single post, but when my camera’s battery ran out, it put paid to that, as I didn’t get it charged and more importantly back out to take photos again for a few days. I’m good with that regardless, as it let me focus on this guy a little more in the photos. As with the previous Nob, some coloured washes on his armour plates and choppa to suggest heat discolouration when it was being forged (or beaten into shape!) 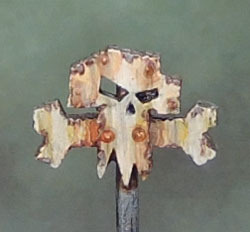 as well as the Blood Axe-ish camo clothing and the tusks and horns on his helm painted in bone rather than silver (which just didn’t work well). For something a bit different on this guy, I took the opportunity to experiment with some rust discolouration effects on white-painted metal. Not a terrible start for a first try, I’d hope you agree? I might try incorporating some crackle medium next time I try it and see how well that works. 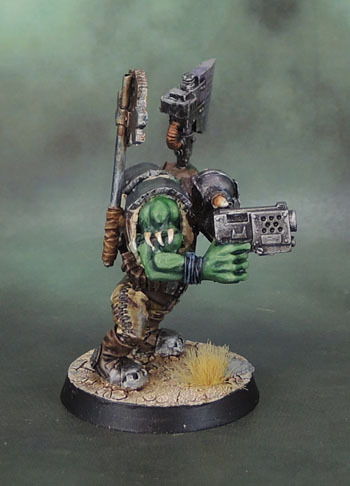 When I get working properly on Ork vehicles and walkers, there should be plenty of opportunities to keep playing with these techniques. 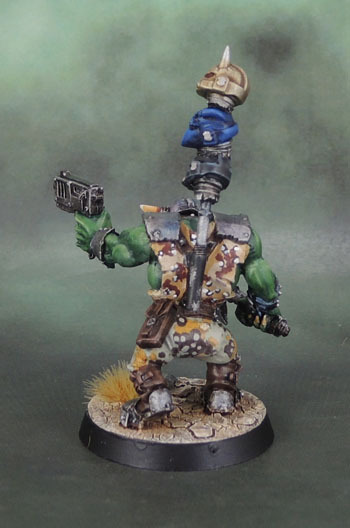 In the last week or so, I’ve finally finished this Ork Nob that goes with about half of the Boyz that I’ve painted. 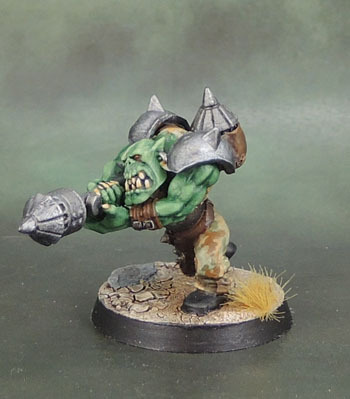 He’s from the old-school metal Nobz boxed set from the mid-1990’s that contained five metal nobs with bosspoles. 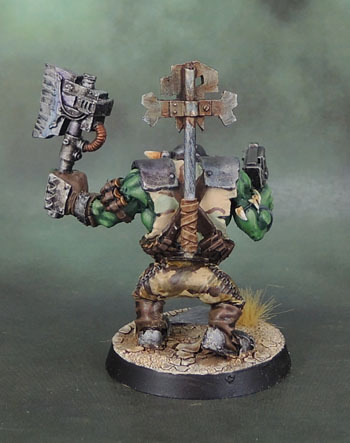 The helmet comes from the metal Black Orcs of the same period, as I wanted the Orks that lead the Mobs to look like particularly nasty bad-arses. Initially I’d painted the horns and tusks in silver, like forged metal but they simply blended in with the rest of the helmet, so I redid them as horn. He’s a hefty dude, and as with the rest of my Orks I’ve painted him with camo clothing to tie him loosely to the Blood Axe sub-faction. And here he is – completing the squad! Well, the Mob. The thing with my challenges is that they’re all about completing stuff, so the fact that this single model was all that was left outstanding for this unit to be completed… well, I was motivated to get this guy done, and now the unit’s is completed. Start-to-finish is all well and good – and great for many instances, but for most of these monthly challenges, I’m more concerned about completing things. 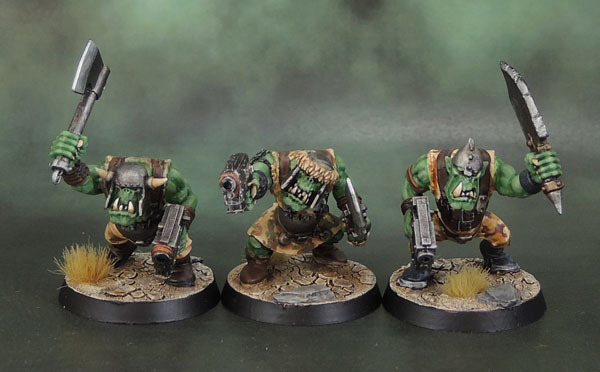 Sure, the number of boyz in the mob might need to be juggled a little to make the unit line up neatly with the most current ruleset, but this group of Orks goes back to 2005, so for now – they’re all good. 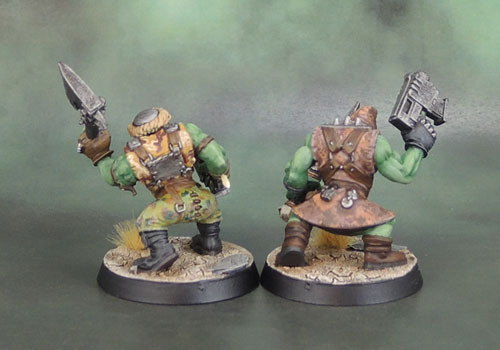 So here’s the next trio of Orks. 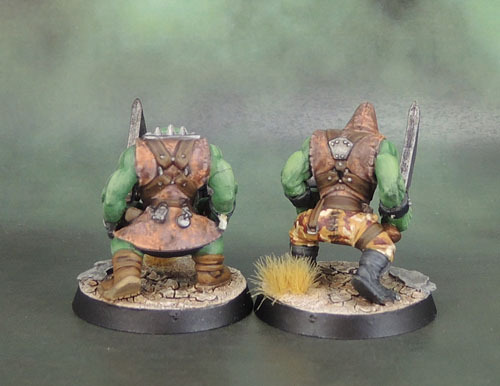 As I stated in the previous Ork-Post, I wasn’t entirely satisfied with how the Autumn Platenenmuster camo from the video guide came out, and while I was poking around the internets, I found another method detailed on Warlord Games’ site, which provided me with the basis for what you see here. I haven’t attempted to minimise the size of the dots in the camo pattern here – instead going for a slightly larger size that suits these particular models. 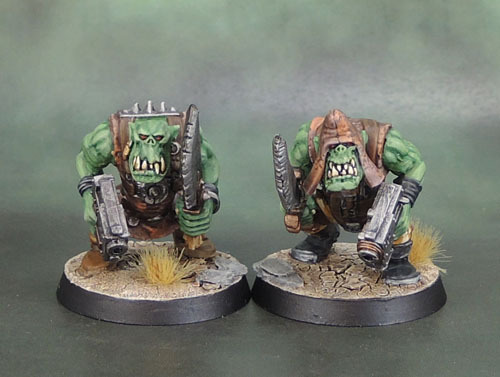 Yeah, more Ork Slugga boyz. 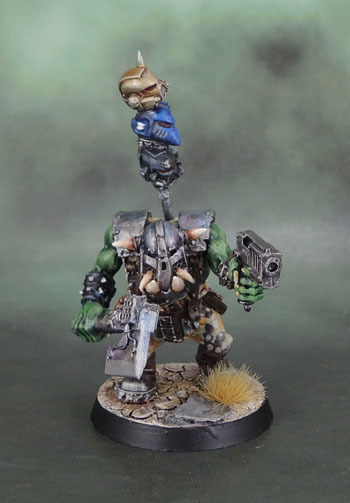 That’s how it works, I guess, when you’re painting a horde army yet wanting to make every model pretty unique. 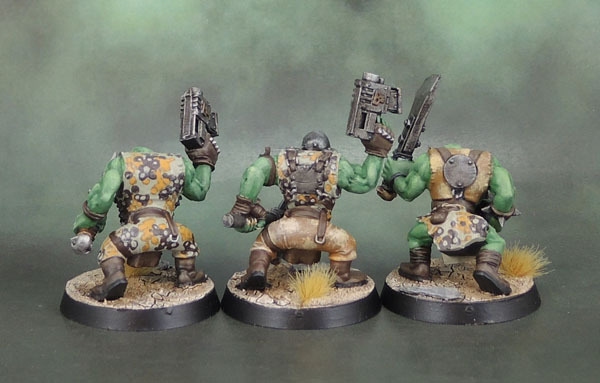 Once again we have a mix of Fantasy and 40k Ork parts that built these four. Several of these were painted black, and it looked decent, but… I was thinking that I should probably save the black (and black camo types) for the Kommandos and similar elites. So they sat again in limbo while I tried to figure out how to paint them. 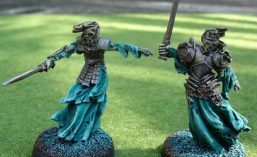 Who should come to my rescue but Warlord Games – in one of their recent newsletters on the 2nd November, they featured a tutorial video by The War Gamer on painting German Plane Tree Autumn Camo. 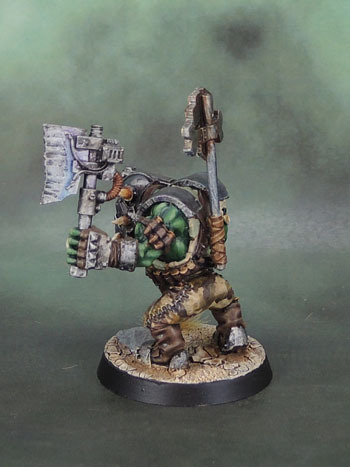 After a few days I got around to watching it, and decided it looked distinct enough from what I already had – and importantly – distinct from the green Ork skin, so worth giving a shot, especially since I picked up the full range of Army Painter paints recently, so I had all of the colours. As you can see, it worked out… reasonably well. Not as nice as I’d hoped – and my concerns about the washes muddying the detail indeed came to light. Still, it looks decent, and so I’m happy enough with it. 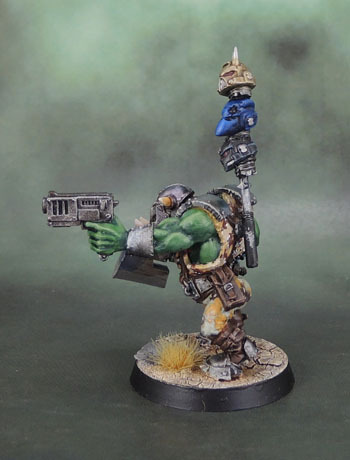 I also found another method to paint the same camo, also on Warlord’s site – which I have been using on the next batch of Orks. Finished soon (probably). 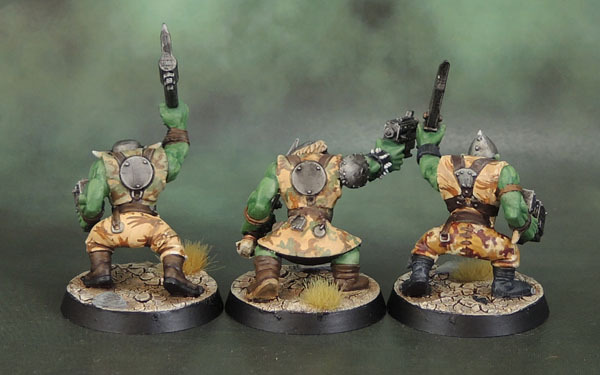 In some fairly pleasant news, after painting these four, I’m almost down to single digits on the number of Orks outstanding from my initial combat patrol force from 2005. 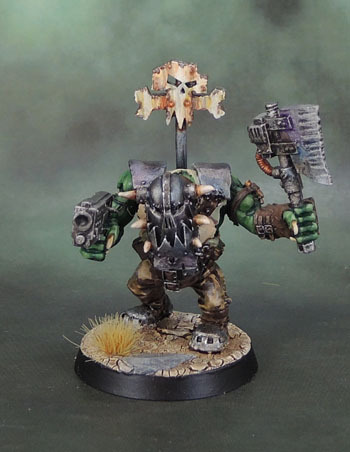 Of course, that includes the Nobz and Warlord, so they’ll take a little longer. 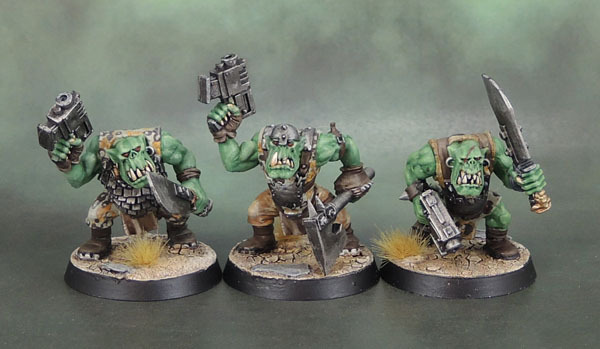 And not counting the grotz… and then there’s plenty more Orks to paint after that! 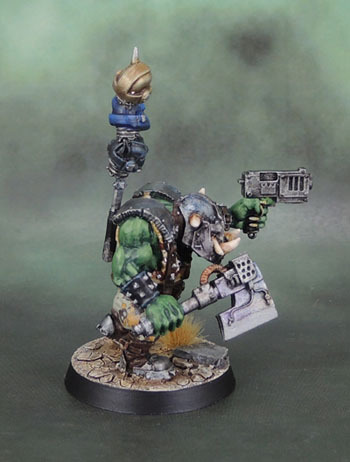 But them ones following will be “new” ones joining the force, and some more Oldhammer Orks. Maybe I should get onto the Diggas I started back in the day and get them finished before starting a whole lot more new stuff? 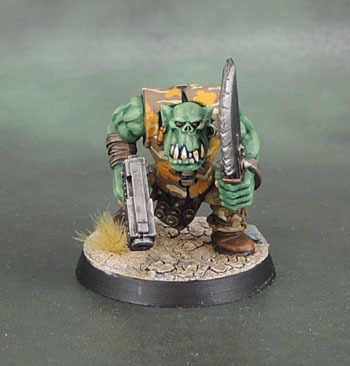 Orktober 2017 #6/WAAAAGH! 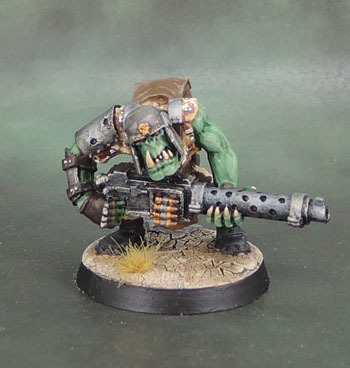 Pt.6: 40k Ork Slugga Boyz.